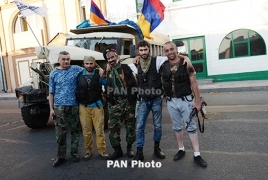 PanARMENIAN.Net - The members of the civil movement Founding Parliament and the Sasna Tsrer group, which captured a police department in Yerevan in summer of 2016, have announced that they will join forces to create a party. According to a statement posted online, the new party will participate in the upcoming snap elections to the Armenian National Assembly. Sasna Tsrer (Daredevils of Sassoun) stormed a Yerevan police patrol department in mid-July 2016 and took everyone inside hostage. They demanded the release of opposition leader Jirair Sefilian and the resignation of then President Serzh Sargsyan. Throughout the following days, the group released the captives one by one. After negotiations that lasted a little over two weeks, the gunmen agreed to surrender to law enforcement bodies. Three police officers were killed during this period. Many of the more than 30 members of the group, who were initially imprisoned, have recently been set free. Sefilian is among the released. Sasna Dzrer member Pavel Manukyan has been released from trial detention after paying AMD 1 million ($2,060) bail. Manukyan, who was wounded during the 2016 Yerevan police building seizure, told reporters that he would like to visit the doctors who treated him and his son, who also participated in the attack. Manukyan was one of the last of the 30 Sasna Dzrer defendants to be released from detention. He declared a hunger strike last week to publicize his plight. 1. Persons sentenced to imprisonment for up to 3 years of imprisonment. 2. Persons who were not subject to a conditional sentence, or who was deferred. 3. People against whom imprisonment has not been applied as a punishment. As a result of the declaration of an amnesty, persons sentenced for up to 6 years of imprisonment are released from punishment. 1.Disabled people of the first or second groups. 2. women who are pregnant at the time the law enters into force. 3. people having 3 or more minor children. 4. Persons with children under the age of three. 5. persons who are over 60 years old. 6 Persons who have committed crimes under the age of 18 years who have not previously been convicted of a deliberate crime, or who have been punished but have no criminal record. 1. Persons may be accused or charged with the commission of such crimes, for which the penalty is a prison imprisonment for a term not exceeding three years 2. persons sentenced to imprisonment for a term up to five years in prison. 3. persons accused or charged with negligent offense, punishable by up to 5 years in prison. 4. Persons accused of or charged with a crime that does not impose a sentence of imprisonment. In accordance with the draft law, the amnesty will also be extended to members of the ''Sasna Tsrer'' group who captured the territory of the Armenian Police PPS Regiment from July 17 to July 31, 2016, as well as people who are in any way associated with the group. In their relation, criminal prosecution may be terminated or they may be released if victims, or physical harm, do not object to this. It will also spread to individuals accused of organizing mass riots on April 24, 2015. This item does not apply to those whose actions led to the immediate death of a person. YEREVAN. – Political activist Jirair Sefilian was denied Armenia’s citizenship, spokesperson for Sasna Tsrer party Hermine Mkrtchyan told Armenian News-NEWS.am. In August Sefilian, a Lebanese-born Karabakh war veteran, addressed PM Nikol Pashinyan with a request to grant him the citizenship of Armenia in a short period of time, however, PM’s chief of staff Eduard Aghajanyan said the issue can be solved through court. The party released a statement saying the Armenian government’s chief of staff in fact stated “there is no desire and will to grant citizenship to Jirair Sefilian. And, if Sefilian does not agree with the decision, he is free to file a lawsuit”. Sefilian has also applied for the citizenship of Armenia according to the normal procedure, but there have been no response as well. Most likely Sefilian will not be able to run in the early parliamentary elections, since he will not manage to get citizenship by that time. Well which is it, did he get it or not? YEREVAN. – The founder of Sasna Tsrer party and Karabakh war veteran Jirair Sefilian will be granted the citizenship of Armenia, acting Justice Minister Artak Zeynalyan said. “The citizenship is granted by the president, we have made a positive conclusion,” he told reporters. Asked whether the matter is president’s focus right now, Zeynalyan said the problem was solved, and the citizenship will be granted. Spokesperson for the party Hermine Mkrtchyan told Armenian News-NEWS.am that Sefilian’s application on granting citizenship post factum was declined.